Sweet - a blog post about corporate resource allocation! What could be more fun? A sharp stick in the eye? Stick with me (hah!) - it actually won't be that painful. Here's the punchline: Great information businesses spend a minority of their resources on creating content and the majority on distributing that content. Alas, many info businesses get that backwards. In an earlier post, we took a deeper dive into the common problems in information businesses. We talked about how many info businesses are subscale - and allocate resources inappropriately. Turns out, those two characteristics are closely linked. First, some definitions: when I say content creation, I mean all the time, money, and effort spent to collect, process, analyze, and package content for customers. In the TV ratings business, for example, that would include all the data collection on who's watching what, calculating viewership share, creating analytics, etc. In the consumer credit reporting business, that would include collecting data on who's paying their bills (and who isn't), creating scoring algorithms to segment consumers, reporting tools to allow buyers to access the data, etc. Content distribution, on the other hand, includes the time, money, and effort spent to market, sell and deliver the content to customers. In most information businesses, that would include the cost of the salesforce, marketing organization, channel sales costs, and the like. Here's the key insight: the secret to a scalable information business is to sell the same information over and over again - with little to no marginal product cost. I know - obvious, right? Maybe in theory, but not so much in practice. For example, I looked at a publicly-traded information business in the IT space recently - it's a sizable company with about $200m in annual revenues. Problem is, it's a break-even business that spends 59% of revenues on content creation. Tack on another 32% for content distribution costs and add in overhead and...bingo! A lousy equation for investors. Here's my rule of thumb: a mature information services business should spend 20% or less of revenue on content creation, and at least double that on content distribution. What's your experience? Please share in the comments below! 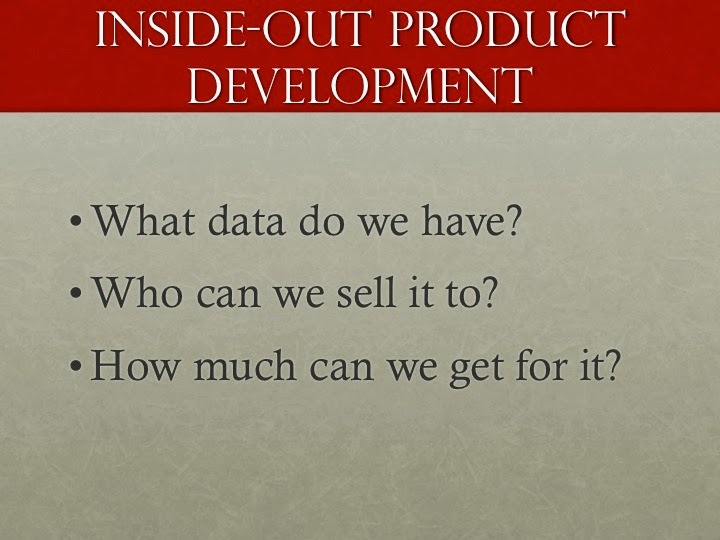 Brutal truth time: the product development process inside most information businesses is fundamentally broken. Most leaders of information businesses with whom I speak intuitively know this to be true. But few are able to put their finger on exactly why things are so broken. 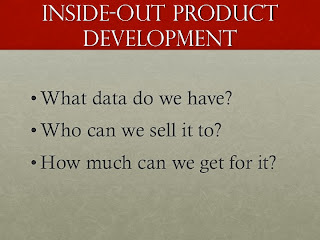 Here's the answer: information business product development processes almost always proceed from the inside-out. They start with the data, analytics, or insight that the firm has - and proceed almost immediately to questions about how to take it to market. The result? An information product or service that meets the company's needs more than the needs of its customers. It's easy to understand why. Product development teams are pressed to do more with the assets the company already has. They have a time crunch to get things done quickly. And they're often measured on the short-term returns on those products. But that thinking is completely spɹɐʍʞɔɐq. Sorry, backwards. Remember our discussion on what makes a great information business? In a nutshell: great information businesses are built on proprietary data, embedded in a business process, and delivered through software. 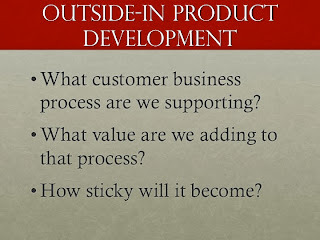 Therefore, a great product development process must focus on these same elements. In particular, effective product development efforts in the info biz usually start with the second element - the customer's business process. 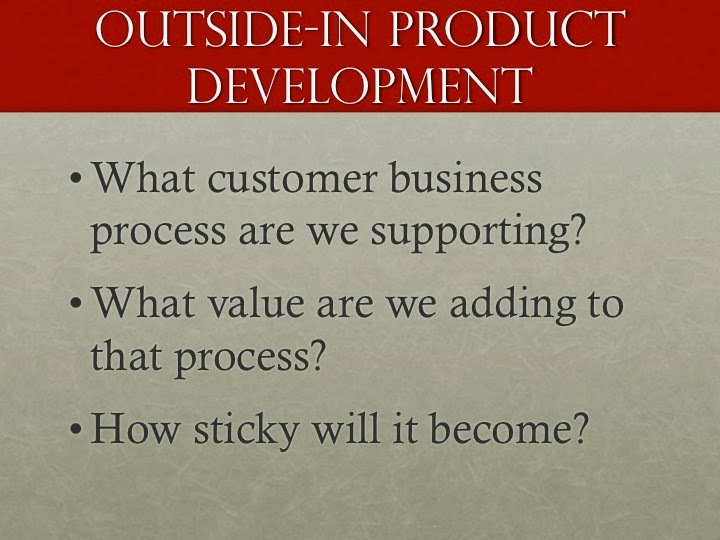 Here's what an outside-in product development process looks like. Note that these questions take the discussion in an entirely new direction. Rather than focusing on what we have, we focus on what the customer needs. And, equally importantly, we zero in on the value delivered - which is key to effective pricing in the info biz. Moreover, this line of thinking allows us to assess the "embeddedness", or stickiness, of the offering. If we determine it won't be embedded enough, we can change course quickly - or move onto a different product offering long before we waste time bringing it to market. So, in a sentence: Product development in information businesses must start with the customer's business process and work backwards to the product offering. How do you know which process to target? Stay tuned - we'll cover that in an upcoming post. How have you developed products in the information services business? Any tips for your peers? As I poke around the information services space looking for my next great gig, I'm increasingly receiving invitations to join the boards of both VC- and PE-backed businesses. In evaluating these offers, I've tried to stay very selective - time is a limited commodity, and as I've said previously, many information businesses are actually quite lousy. But I've recently joined the boards of two great companies - CallMiner and Buyers Lab, with a couple more waiting in the wings. The former is a hot VC-backed company doing some amazing things in the call analytics space. The latter is an example of a great information business. Check 'em out. When I contemplated joining these boards, I was a bit adrift in terms of nailing down market compensation for the role. Given my background, I did what came naturally: I conducted some market research to find out the answer. I received over 40 data points from helpful folks in my network, including some recent (2011) benchmark data. All were from well-respected and experienced VCs, PE investors, startup CFOs, and the like. While all the data points help understand the appropriate compensation range, it’s worth noting that many participants emphasized the specificity of individual situations. For example, outside directors brought in to offer specific expertise (access to their network, advice on operations, help in selling the company, etc) often received one-off compensation packages which fell outside these ranges. Equity compensation. Not surprisingly, equity comp is the most prevalent (cited in 100% of individual responses and 93% of benchmark data). All those who used equity comp for outside directors employed up- front grants, while a substantial majority (84% in benchmark data) also offered some form of ongoing, annual grant. Equity vehicles were heavily weighted towards options, with only about 15% offering restricted shares. Some experienced directors in the sample said they are trying to change this mix more towards restricted shares. Size of initial grants ranged from 8 to 100 basis points of fully diluted company ownership. Three factors appear to govern where in this range the grant is likely to fall: size/stage of company, day-to-day involvement in the company, and committee assignments. Across the board, the earlier stage the company, the greater the size of the grant. Median responses seem to cluster around 50 basis points, but that may be related to the nature of the sample. Outside directors who commit to spending specific time with the company (e.g. a day a week) tended to fall on the higher end of the range as well. Committee chairmanships among outside directors in the sample were few, but generally seem to merit an increase of 10-20 basis points. Vesting schedules were weighted towards four-year vesting, with most vesting on a monthly basis (note that a substantial minority had a cliff vest at year one, with monthly vesting thereafter). Vesting triggers were also relatively common – including full vesting upon change of control in nearly all cases. Experienced directors also noted that they seek – and often get – relatively long post-service exercise terms of a year or more. Cash compensation. Here there were substantial differences between PE-backed and venture-backed firms. Very few early-stage venture- backed firms offered any cash compensation; in contrast, some later- stage PE-backed firms offered meaningful cash compensation. Overall, approximately 4 in 10 firms in the sample offered cash compensation. About half of those firms which offered cash compensation used an annual retainer alone; the remainder mostly some combination of annual retainer and meeting fees. Annual retainers (when employed) ranged from about $15k to about $30k for VC-backed companies, and from about $25k to about $90k for PE- backed. Outside chairs of key committees – primarily Audit and Compensation – are likely to also have additional fees paid, though they seem to range widely. Meeting fees (when employed) ranged from $500 to about $3k for in- person meetings, and about half that for telephonic meetings. Nearly all reimbursed direct meeting travel expenses for non-local board members. Other compensation. There was no clear pattern around other compensation categories. Some firms offered health insurance to directors, for example, while others offered more humdrum compensation like meals at board meetings. Other factors. Experienced directors and attorneys in the sample noted that outside directors certainly require firms to provide high-quality D&O insurance. In addition, some suggested the importance of specific indemnification arrangements for directors, separate and apart from those arising under corporate bylaws. Does your experience match the data above? Please share!